The AmazonBasics 6-Sheet Cross-Cut Shredder is a compact little powerhouse that gets the job done at a very affordable price point. Information security is more important now than ever before, and securing your financial and personal details doesn’t end with choosing strong passwords online. Every time you throw out papers that contain sensitive information like your social security number, credit card numbers, bank accounts, or anything else of importance, you run the risk of that information falling into the wrong hands. We recently put the AmazonBasics 6-Sheet Cross-Cut Paper and Credit Card Shredder through its paces to see what it can really do. We evaluated whether or not it can handle the advertised workload, how effective it is at destroying important documents and credit cards, how much noise it makes during operation, and more. The AmazonBasics 6-Sheet Cross-Cut Shredder isn’t much to look at, but are you really looking for flashy design flourishes on your paper shredder? The unit is small enough (11.5 x 8 x 15 inches and 8 pounds) to slide under your desk, so it isn’t likely to be a conversation piece anyway. With the safety switch implemented, your fingers are safe if you forget to turn the shredder off or unplug it before emptying the bin. The shredder takes design cues from the classic budget-priced shredders that are designed to sit on top of a wastepaper basket, with the caveat that this particular shredder only works with the collection bin that it comes with. Aside from the fact it’s sized to fit the bin perfectly, it’s also limited by a safety switch that triggers to prevent it from working outside of the bin. That’s a good thing because the shredding blades are completely exposed every time you remove the shredder from the collection bin. With the safety switch implemented, your fingers are safe if you forget to turn the shredder off or unplug it before emptying the bin. While the shredder isn’t completely ready to go right out of the box, it’s pretty close. It comes in Amazon’s famous easy-to-open packaging with the shredder unit itself resting inside the collection bin. The setup process consists of removing the bin from the packaging, removing the shredding unit from the bin, and then setting the shredding unit on the bin. With the shredder assembled and plugged in, all you have to do is flip the control switch to the auto position. That’s really all it takes, and the shredder is ready for use. If you periodically shred a lot of documents, you can leave the control switch in the auto position rather than turning it off. This allows you to slide documents in whenever you want. The AmazonBasics 6-Sheet Cross-Cut Paper and Credit Card Shredder is on the low end in terms of how many sheets it can shred at once, but it does an admirable job at the level it’s designed to operate at. When feeding six or fewer sheets at a time, it works quickly and with very little protest. Depending on the weight of the paper you’re disposing of, you may even be able to shred a few extra sheets. It will jam at about eight sheets of standard paper, so you have to be very careful shredding junk mailers if they are too thick. However, jams are extremely easy to clear. The shredder includes a reverse mode, and flipping to that mode clears most jams effortlessly. Amazon states that the shredder is capable of handling both small paperclips and staples, and we were able to verify that during our testing. Stay away from laminated items and tape, and junk mail with plastic see-through panels is a bad idea anyway due to the tendency of the shredder to choke on unopened mailers. When feeding six or fewer sheets at a time, it works quickly and with very little protest. In terms of shred size, this is a cross-cut shredder. That means instead of creating long strips, it cuts the strips into smaller chunks, which makes it more difficult for someone to reassemble a document later. Each shred is about 7/32 inches wide and 1 27/32 inches long, which isn’t bad for a shredder this small and affordable. It’s fine for both home and home office uses, but it definitely won’t cut it for more sensitive information like medical data or government documents. The tradeoff of compact size is a correspondingly small collection bin. After just a few minutes of use, the 3.8-gallon collection bin was already more than half full. That’s fine for occasional use, but if you shred a lot of documents on a regular basis, expect frequent breaks to empty the bin. It also takes two hands to separate the bin from the shredder, but the bin itself is small enough that it’s very easy to handle even when it’s completely full. The AmazonBasics 6-Sheet Cross-Cut Shredder is primarily designed to shred paper, but it can also dispose of your old credit cards. It only has one shredding mechanism, and one feed slot, so credit cards are subjected to the same cross-cut shredding process as your documents. This is both easier and far more secure, than cutting your cards up with scissors, though it won’t match the peace of mind of a micro-cut shredder. Overall, the shredder does a decent job of chewing through credit cards, but it’s still a good idea to take a look in the bin afterward. Depending on how you feed the card through, there’s a chance you may leave numbers intact enough for someone to read. Unlike some other paper shredders, Amazon recommends that you don’t shred anything else, like CDs and DVDs, with this unit. You’ll always know when the AmazonBasics 6-Sheet Cross-Cut Shredder is running because it makes quite a bit of noise. We measured it at 71 decibels, compared to the 66 decibels generated by the more expensive AmazonBasics 12-Sheet Micro-Cut Shredder that we also tested. Since this shredder sits on top of its collection bin, more sound is able to escape while the unit is in operation. The level of noise isn’t deafening, but it is too loud to use if anyone is trying to watch television or take a nap in your general vicinity. Amazon got the price right in terms of value for the features you get. Priced at $34.99, this shredder is not only cheap, it has has a more secure cross-cut pattern instead of a basic strip-cut pattern you see in a lot of other shredders in this price category. When you compare the AmazonBasics 6-Sheet Cross-Cut Shredder to others in its price range, it stacks up pretty favorably. The sheet capacity, shred speed, and bin capacity are all on par with competitors, but it has the added security that comes with cross-cut. When compared to more expensive shredders, it lacks two important features: micro-cut and the ability to shred disc-based media. If you’re dealing with especially sensitive information, or you need the ability to destroy CDs and DVDs, then you should look at more costly options. When you compare the AmazonBasics 6-Sheet Cross-Cut Shredder to others in its price range, it stacks up pretty favorably. There are a handful of other shredders that can get the same job done for a similar price. 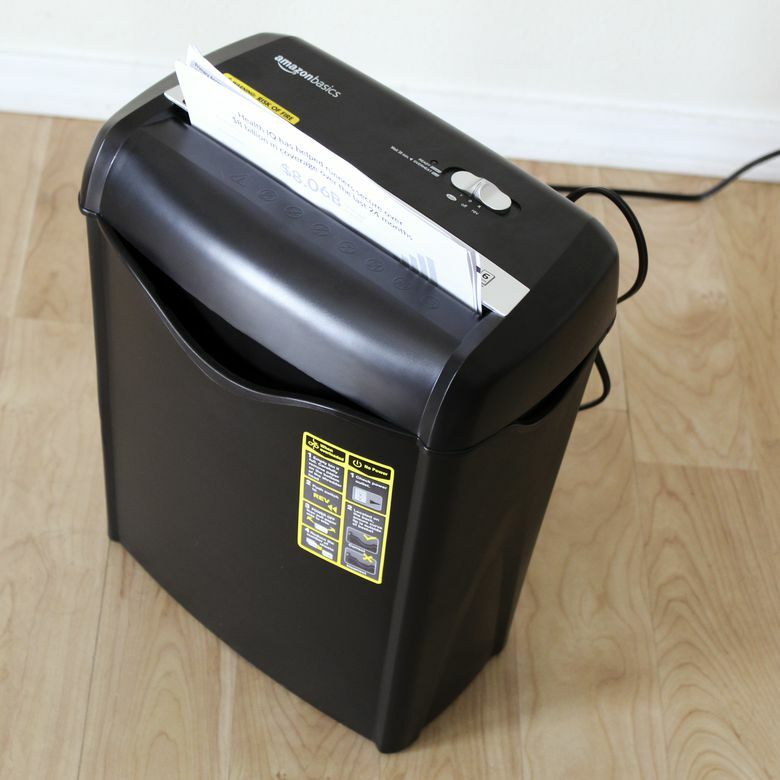 For example, the newer AmazonBasics 8-Sheet Cross-Cut Shredder has a larger capacity and an identical MSRP of $34.99, but it’s a little bit bigger, so it may not slide under your desk as easily. If you don’t mind the bigger size, this is a great alternative to buy. Also from Amazon, is the AmazonBasics 12-Sheet High-Security Micro-Cut Shredder which can handle optical media and has a more secure shred. However, it’s significantly more expensive at $99.99. Finally, the Swingline Prostyle+ has a similar level of security to the AmazonBasics 6-Sheet unit, in a similar size, but it costs more. In that case, you’re paying a premium for a more attractive design and a much longer run time. Want to read more about other models? Check out our list of the best paper shredders available now. An affordable (and basic) way to shred sensitive documents at home. The AmazonBasics 6-Sheet Cross-Cut Shredder is an excellent piece of hardware for home office use, provided you aren’t dealing with any regulations that require a micro-cut shredder or better. It’s small enough to fit in most home offices and even slide under some desks. Perhaps most importantly of all, the price is just right. Product Dimensions 11.5 x 8 x 12 in.